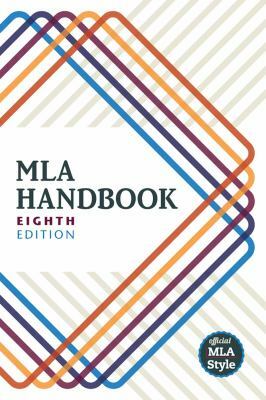 The rules for citing using MLA style recently changed from the 7th edition to the 8th edition. Please check with your instructor about which edition you should follow. Also refer to the MLA Handbook or the MLA website for detailed information. This guide only demonstrates some basic examples. Use the elements below when creating citations for all types of resources. The elements should be used in the top-down order. If one of the elements is not available, move on to the next one on the list. Some citations may repeat steps 3-9. Optional elements should be placed at the end of the citation or following the element to which it relates. See pp. 50-53 of the Manual to learn more about when you might want to include these elements. Examples on using the core elements to create different types of citations. Awesome site for finding explanations and examples. Courtesy of Purdue University's Online Writing Lab (OWL). Try your best to identify the following core elements from the source you wish to cite but realize that not every source will have every piece of information. Omit any of the elements that are not relevant to your source but keep the remaining elements in the correct order in your citation. The image to the left shows how to punctuate following each element. Capitalize each word of title except for articles like the, an, or, of (unless they are the first word of the title or subtitle). Place quotation marks around the title if they are part of a larger source like journal article, chapter title, or short story in a collection. Italicize titles of self-contained words like books or movies. Italicize titles of any work that would normally be self-contained but appear in a collection. Follow it by the italicized title of the collection. For example, a novel that appears in a collection of an author's complete works. See Manual pp. 25-29. A container refers to anthologies, collected works, journals, tv series, websites, etc. 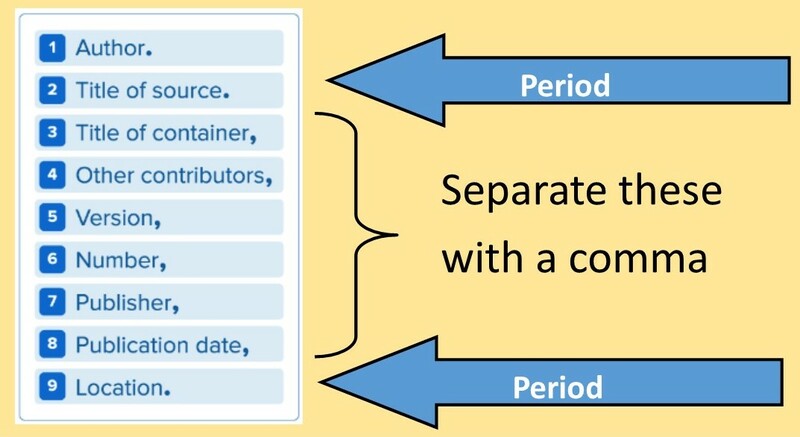 It is possible for a container to be nested inside another container. A journal article (source) appears in a journal (container) which is housed in a library database (container). List subsequent containers after providing the details for the previous containers. See Manual pp. 30 - 36. List others who contributed to the work if they are important to your discussion (i.e. adapted by, edited by, illustrated by). Followed by the contributor's name. General format would be: General editor, Firstname Lastname. If there is a version listed, include it. Examples include: revised edition, unabridged version, director's cut. See Manual pp. 38-39. This can include things like volume number, series, issue number, season or episode. Publisher refers to whomever is responsible for producing the content. Exclude the publisher for periodicals (newspapers, magazines, journals); self-published works; a website that has the same title as the publisher, work appears on a website that isn't responsible for publishing the content (YouTube, Wordpress, Twitter). See Manual pp. 40-42. If more than one date listed, choose the one most relevant to your situation. Can use a date range if applicable. For books, check the book's title or copyright page instead of relying on a bibliography from another source or commercial website like Amazon. See Manual pp. 42-45. Location typically refers to page number(s) reflected as p. or pp. Can also be a URL or web address. Ask your instructor if they require it. Use a stable or permalink URL. If available, use the DOI (digital object identifier) instead of a URL. It can also mean a physical location like a disc or track number or museum, location of event, institution or venue and city (unless city is part of the venue's name). See Manual pp.46-50.